april 30 — we cleaned up the back yard and ran errands… and we listened to TMBG together and watched that great simpsons episode from sunday night a couple more times (the one where marge accidentally cuts off homer’s thumb) and we went to morris dancing practice at night. i was really tired, though, and my ankle is hurting again. april 29 — today was a happy day! i got 10 hours of sleep last night and i felt wonderful all day. i found the tripod and took some photos of myself — we’ll see how they turn out. april 28 — i cleaned our room very well today and learned some more about my camera (nikon N70). my monitor is getting worse and worse. april 26 — i’ve been working on getting my blackbox windowmanager set up and i am SO happy with it! 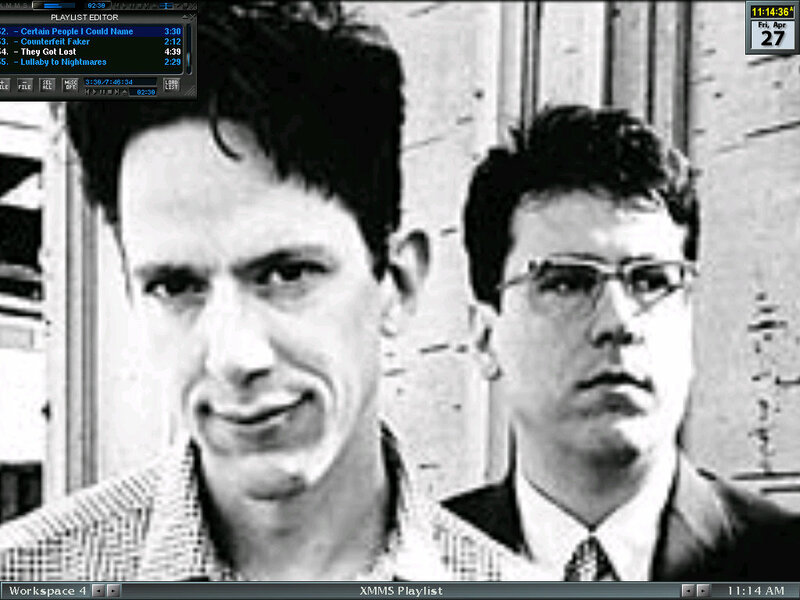 i’ve got lots of keyboard shortcuts, a full-width toolbar, my wmcalclock up in the top right, and i created nice tasteful tiny-plaid wallpaper and i figured out how to set it as wallpaper (that’s a pre-screenshot-shortcut screenshot :) and today i found a great B&W photo of the johns from tmbg, and i messed with it in the gimp until it was just the right size for my screen (that’s my current desktop) and oh my i am happy! april 25 — henry’s first junior theater class was today! he loved it and had a wonderful time. after the class we played in the park with talon and henry’s new friend sasha, a very sweet little girl who is in the class too. april 24 — busy day! i felt as if i spent the entire day on the freeway. first, in the morning, we drove to serra mesa for a nifty home-schooler science class about acids and bases. we got to do all kinds of fun tests and experiments, and henry loved it. we get to do another class next tuesday. then we raced back up the freeway to be in time for henry’s gymnastics class. he spends the entire hour of that class smiling — it’s wonderful. :) then we raced back down the freeway to the airport to pick up grandma jean and her friend, and then we crawled up the freeway in the pre-rush-hour rush hour to get home. and then i taught a student for sally. *whew* busy day! oh and at night kirsten and i watched “bringing up baby”. it was kind of funny to see katherine hepburn playing a ditzy-girl character. april 23 — this afternoon i suddenly felt human again! i took henry to the bank to deposit his $3.91, and he asked for a sewing lesson so i cut a little square of stiff white interfacing and drew dots on it and showed him how to stitch up and then down, on the dots, and he went all the way around the square and now i have a nice coaster for my desk! and then he wanted to make a blanket for mary doll, so i gave him a piece of gray felt and punched holes around the edge, and he went all the way around in blue yarn and it’s a lovely blanket. :) and then later we mowed the lawn and watered his little garden. we made vegetable barley soup for dinner. he’s dressed in his “gentleman” clothes; little jacket, white shirt, trousers. :) gonna go read to him now. oh, also, i’ve been messing with a windowmanager called blackbox (i have been using windowmaker) and today i finally got it configured enough to be non-annoying and actually pretty good. i have no icons at all on my desktop.. just how i like it. april 22 — i feel a little better today. april 21 — i have the flu. i need someone to bring me soup and juice and rub my achy muscles. april 17 — we cleaned our room today! got it all picked up and vacuumed and nice, washed the sheets and everything. and i took the suspect cd-rom drive out of henry’s computer and put it in strangelove, to see if it was REALLY broken and sure enough, it is. but pthree might have one that he can spare, and irq found me some good cheap ones on the interweb, so either way i’ll be able to get his computer all better for him soon. we found him a neat freeware little-kid version of Space Invaders today; it’s easy enough to be fun for him. we’re up to chapter eight in “Prince Caspian”! oh, and i bought a little piece of narrow brown ribbon to hang my locketwatch from. the chain broke ages ago and i’ve been using a nasty bit of red yarn. i feel quite elegant now. april 10 — ok, someone take nethack away from me now… ;-) henry and i took a nice walk all the way down to the walmart today, and i bought him some sidewalk chalk. april 8 — henry’s loose tooth fell out, so he is all excited, waiting for the tooth fairy to come! i got a new game — nethack — for my linux box and my it’s fun. it’s an ascii rpg, rather complicated with lots of commands to remember. i played a lot today, and tomorrow i’m going to show henry. i think he’ll like it. april 7 — i finally figured out how to make my own coaster in rollercoaster tycoon! henry and i have been playing for days, but we just couldn’t seem to make a coaster that worked, but today we finally did. go team kara and henry! april 6 — too tired to write stuff. april 4 — i took henry to play with his friend talon at the park today (a strange swarm of bees drifted across the park near our blanket and we ran away until they blew further down the park), and then i took him to chula vista to play with nicolas, whom we haven’t seen in ages. it was really nice to see nicolas and alina again. i almost went to sleep on alina’s couch, i was so tired. henry had a really great time playing with his friends. he wore his superman costume all day. april 2 — still not sleeping well. henry went to the dentist today and was SUCH a good boy. april 1 — bah, i did NOT get enough sleep last night. i couldn’t sleep and was up ’til around 4. and now because of the silly time change, instead of being 10 it’s 11. yuck. but oh well. at least i feel pretty good again and my sore throat is mostly gone. henry made me a lovely present on saturday while he was with matthew at lucille’s house — he colored some popsicle sticks green, cut some flowers out of a magazine, taped the flowers to the sticks, and put the bouquet in a little glass dish for a vase, and it’s just lovely. :) he’s a wonderful boy!